Madden NFL and FIFA 08 weren’t enough to keep Electronic Arts from posting lower sales and a net loss for its fiscal second quarter, but the firm still beat guidance. The Redwood City, Calif.-based megapubisher reported revenues of $640 million, down 18 percent year-on-year for the quarter ended September 30. Guidance was set to be between $465 and $570 million. Net loss for the quarter amounted to $195 million versus net income of $22 million a year ago. Loss per share was 62 cents, which likewise beat Q2 guidance. 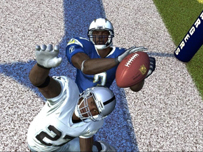 EA said that August’s Madden NFL 08 was the prime seller for the quarter with 4.5 million units sold. FIFA 08 sold 2.9 million copies worldwide. The new MySims for Wii and DS sold over 1 million copies, according to the company. The biggest news for EA during the quarter was the October announcement of plans to acquire revered independent duo-studio BioWare/Pandemic for $860 million. Following the announcement, EA shares hit a two-year high. "We think this will be a great holiday season for consumers," said CFO Warren Jenson in a statement. "We plan to launch over ten titles including The Simpsons Game, Need for Speed Pro Street, Hellgate: London, Rock Band, NBA Live 08, SimCity Societies and Crysis." For the fiscal year ending March 31, 2008, EA expects revenues of $3.35 to $3.65 billion, up $150 million from previous guidance. Loss per share is expected to be between $1.60 and 91 cents, a greater loss than implied by previous guidance of between 63 cents and 10 cents. For the big holiday December quarter, EA expects revenues of $1.3 to $1.6 billion and loss per share between 28 cents and income of 12 cents. EA also announced plans to close down facilities including EA Chertsey over the next two years as part of restructuring plans that may amount to charges between $90 and $110 million. Most of these charges will be felt this fiscal year. Can you feel The Force? You better hope so! Join Jedi Knight Obi-Wan Kenobi in level after level of non-stop action. Star Wars Obi-Wan, will demand for the player to use his Jedi skills as he destroys..